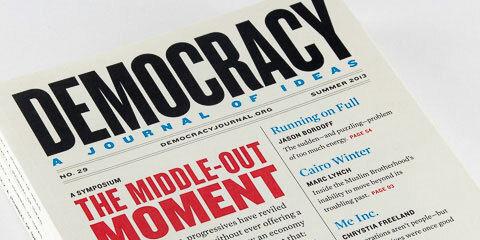 Obama’s electoral wins and our shifting demographics portend a bright Democratic future. So why do centrists insist on fighting battles long won? With those words, Mehlman managed to say more about the GOP’s electoral success in the post-Vietnam decades than Jeffrey Bloodworth does in his entire new book, Losing the Center. Bloodworth, a Gannon University historian, returns to liberalism’s electoral dark days following Richard Nixon’s 1968 election to the presidency. Losing the Center’s working title was The Wilderness Years; the change reflects Bloodworth’s argument that the Republican ascendency was driven not by any external factors such as race but by “decades of ideological incoherence and political ineptitude” on the part of liberals. In Bloodworth’s familiar telling, the Democratic Party experienced an ideological civil war in the late 1960s, pitting “Vital Center liberals” against “New Politics liberals.” The former, epitomized and defined by Arthur Schlesinger Jr., were characterized by “an antiutopian fighting faith committed to national greatness at home and human freedom abroad.” It was a creed that fused FDR’s optimism with Reinhold Niebuhr’s theology—a soup comprised of lessons from the New Deal, the Holocaust, and Stalinism. New Politics liberals, conversely, were the heirs of the “Progressives of the early twentieth century, and the Stevensonians of the 1950s,” reincarnated during Eugene McCarthy’s 1968 presidential campaign. Their priorities included anti-anti-communism, abortion rights, and economic populism. New Politics liberals tried to form a coalition of “feminists, minorities, the elderly, educated elites and the youth,” Bloodworth claims. Unfortunately for them, this alliance fell far short of an electoral majority. Losing the Center’s confusion about the historian exemplifies the book’s overestimation of the importance of internecine ideological warfare. In the book’s telling, Republican success was reversed in the early 1990s only because Democratic moderates, “[b]y no means a majority in their own party…proffered a centrist liberal agenda that returned Democrats to the White House.” Bill Clinton did recapture the presidency by distancing himself from the liberal wing of the party. But he did so not only by prioritizing “debt reduction, government reorganization, and free trade,” as Bloodworth claims. Clinton redefined the Democrats on the all-important issue of race. By embracing welfare reform, passing harsh anti-crime measures, and publicly scolding Sister Souljah, Clinton destroyed the caricature of Democrats as concerned primarily with the interests of minorities. Race is barely discussed in Losing the Center. But race, not the liberal policy agenda of any supposed Eugene McCarthy-inspired coalition, was the primary reason for conservatism’s triumphs. Members of the white working and middle classes migrated from the Democrats to the Republicans largely in response to the former’s support of equal rights and opportunities for African Americans. Now that demographics are shifting beyond a white majority, Democrats are doing better. Presumably, conservatives will eventually adjust to political reality and moderate at least some of their policies. Once that ground starts shifting, latent Democratic fissures could reappear, and the party will face its own internal struggle over the future. Well-researched and readable, Losing the Center profiles failing liberal politicians and intellectual activists in the post-Vietnam era. Most of them—Minneapolis businessman Donald Peterson, Oklahoma Senator Fred Harris, and Arizona Congressman Morris Udall, among others—are categorized as “New Politics” liberals. Exactly what that means isn’t entirely clear, however. “Though New Politics adherents are easily categorized by their income group (middle class) and racial homogeneity (white), a definition is more slippery,” Bloodworth concedes. Since New Politics liberals are the villains of Losing the Center, this is a problem. As with his Schlesinger misstep, Bloodworth oversimplifies FDR with this formulation. Franklin Roosevelt did dislike the dole, but the New Deal did not fit cleanly into the opportunity liberals’ paradigm. It encompassed wild programs for cooperative communities, nationalized industries, and celebrations of democratic collectivism, as well as examples of opportunity liberalism. Similarly, Harry Truman, who should count as the quintessential Vital Center liberal, advocated universal health insurance, government-guaranteed full employment, and huge increases in disability and unemployment benefits and public housing. All of this was far more progressive than anything Carter, Walter Mondale, or Michael Dukakis ever proposed. Losing the Center is on firmer ground categorizing New Politics liberals as having a unified perspective on foreign affairs. In chapters on Senator Henry “Scoop” Jackson and speechwriter Ben Wattenberg, the book shows how “Vietnam caused New Politics liberals to reject interventionism. Fearing that intrusions would lead to other Vietnams they increasingly relied on nongovernment organizations to make their human rights claims across borders.” Indeed, Democrats never solved the problem of devising a foreign policy that eschewed an excessive reliance on military force, employed multilateralism and diplomatic solutions, and attracted American voters. Bill Clinton and the Democratic Leadership Council’s later prescriptions were mostly to return the party to its pre-Vietnam roots. This approach was largely successful in the 1990s, but it led many Democrats to support the Iraq War in the early 2000s. Consequently, Jackson “blindly backed the Vietnam War.” Yet that fails to convince Bloodworth that New Politics liberals were onto something. “That the redeemer nation motif leads to unnecessary conflicts is all too, and tragically, true,” he writes. “It is, nevertheless, a theme that liberal policymakers must heed.” How that theme should be translated into wise policy is left unexplained. New Politics liberals never managed to offer foreign-policy ideas that were both popular and sagacious, but it cannot be said that Vital Center liberals of the time did either. There is some truth to this. Crime was rising fast in the 1960s, and Democrats had no good answer. What answers they did have were inadequate. Liberals initially denied that crime was rising, and then they prescribed measures tackling poverty and unemployment that didn’t seem like solutions at all. And yet, it is also true that “law and order” was frequently a code phrase for bigotry. Not just crime and riots but peaceful demonstrations and labor strikes were conflated under its rubric. That rubric included, most unjustly of all, the civil rights movement. When Martin Luther King Jr. was assassinated in 1968, Ronald Reagan’s explanation was that it was just the sort of “great tragedy that began when we began compromising with law and order, and people started choosing which laws they’d break.” Dixiecrat Strom Thurmond and National Review publisher William F. Buckley agreed, and earlier in 1966, Richard Nixon said similar things. Alabama arch-segregationist George Wallace made “law and order” the centerpiece of his 1968 presidential campaign, and the nearly ten million voters who listened to his rhetoric and supported him knew exactly what he was really saying. It wasn’t just the racism of politicians that was a problem: By 1968, a majority of the country agreed that “negroes who start riots” and “Communists” were responsible for the breakdown of law and order. The biggest flaw in Losing the Center is that it imagines that Democrats could have somehow become the party of African-American and women’s rights without losing significant portions of its white base. Given white males’ level of hostility toward feminism and civil rights, this was impossible. The party basically had to choose between equality and popularity. It chose the former. That decision can be debated, but Bloodworth acts like such trade-offs didn’t exist. More importantly for the present, Losing the Center gives the impression that demographics, to the extent they matter at all, remain static over decades. If Democrats do not reincarnate in John Kennedy’s image, Bloodworth suggests, they will continue to lose elections. “[L]iberalism has today become the reserve of coastal elites, urbanites, intellectuals, minorities, and the young,” he writes. It’s a curious statement to make in 2013, after the country’s first black President was comfortably re-elected. Losing the Center isn’t just a history of liberalism from 1968 to 1992—it feels like it was written in 1992. Two important, related changes have occurred since the period surveyed in Bloodworth’s book that together offer liberals an opportunity to once again foreground equality. First, demographics have shifted in favor of the Democrats, and second, the political effectiveness of the combustible mixture of race, welfare, and crime that so devastated Democrats for decades has worn off. As candidate and President, Clinton succeeded to a significant degree in puncturing the GOP’s Southern strategy. He managed the extraordinarily difficult feat of appealing to the white working class while still retaining the affection of the African-American community. He appeared tougher on crime than Democrats before him, doing everything from approving the execution of a mentally retarded black man to signing bills mandating tougher drug laws. Now, Clinton’s electoral success came at a significant human cost, much of which was borne by the African-American community. But by lowering racial tensions and nullifying the Southern strategy, Clinton helped make President Barack Obama possible. Besides being as much of a New Politics liberal as a Vital Center one, Obama symbolizes the demographic shifts that are overhauling American politics. Those demographic changes are well known by now. Nearly nine out of ten Republicans are white, but whites continue their decline as a percentage of the electorate. Hispanics, Asian Americans, and millennials are all growing as a share of the electorate, and they all vote Democratic to one degree or another. The GOP’s challenges are compounded by the fact that altering the party’s policies in one area to appeal to new voters has the effect of alienating another of the party’s key demographics. Even Ken Mehlman’s anodyne remarks to the NAACP elicited pushback from Rush Limbaugh, who complained, “Republicans are going to go bend over and grab the ankles….It’s absolutely absurd.” More substantively, George W. Bush and Karl Rove learned that attracting Hispanic support by supporting a humane solution to illegal immigration antagonizes much of the Republican base. The Southern strategy that led Republicans to electoral success for decades is now a strategy that leads to electoral failure. Just as Republicans are finally rushing to moderate on immigration and (to some extent) gay rights, Bloodworth imagines that liberalism is still as unpopular as bell-bottom jeans. He urges Democrats to moderate their ambitions. He is not the only one. Surveying the 2012 election, a report from Third Way recommended that Obama prioritize bipartisan deals on deficit reduction and reforming Medicare and Social Security. “The Obama Coalition elected the President on the hopes that he would work with Republicans to solve the major fiscal issues facing the country,” read the report. Curiously, the report overlooked the poll’s most interesting findings: 39 percent of Obama voters worried he would compromise too much with Republicans to get things done, while only 28 percent worried he would stick too rigidly to his positions and not get things done. Similarly, 40 percent were concerned he would cut a deal that slashed too much spending, while just 31 percent thought he wouldn’t do enough to reduce the deficit. Those results were buried in the appendix. When Bloodworth contends that New Politics liberals cared more about moral rectitude than electoral victories, he is projecting the present tendencies of centrists. It would be one thing to encourage Democrats and liberals to move rightward if it were electorally necessary—it’s quite another to advocate doing so when Republicans have lost the popular vote in five out of the last six elections. Democrats must be doing something right at the moment, but Losing the Center simply cannot admit it. Centrism becomes in the author’s hands not an electoral strategy but a sign of seriousness. Liberals and Democrats of all stripes must resist this temptation to declare defeat at the exact time the party is garnering victories. Of course, it helps that Democrats are currently as united as they have been at any time in the post-Vietnam era. When the Democratic Leadership Council (DLC) closed in 2011, it symbolized the end of the civil war described in Losing the Center. The DLC had been badly injured by its support for the Iraq War, but its effectiveness also contributed to its demise. Vital Center Democrats such as those profiled in Bloodworth’s book can justly claim to have transformed the Democratic Party on issues like taxation, national security, welfare reform, and free trade. But centrists still have difficulty seeing that 2013 is not 1973. Shortly before the DLC’s shuttering, the organization’s co-founder Will Marshall said, “It is dawning among progressives that they need to rebuild their support among centrists and moderates.” In fact, it should dawn on centrists and moderates like Marshall and Bloodworth that demographics are changing in progressives’ favor. Not since the Great Society years have conditions been so favorable to liberalism. Efforts to pre-emptively waste a rare opportunity to implement progressive policies because of fears of a right-wing backlash are as outdated as the subjects in Losing the Center.